We talked about Turin, Italy with Gennie, who lives there. A stunning view in the picture below represents a gorgeous horizon looming over the Italian Alps. It is difficult to guess what is the tallest building in this photo if you don't know the answer. This is the oldest Cinema Museum and it looks like a big tower, which is the highest structure in Europe (167,5 m). The North of Italy where Turin located is one of the most developed parts of Italy. Fiat Automobiles Factory is based in Turin, and it is the largest automobile manufacturer in Italy. The next great tourist attraction is an Egyptian museum. It is the second biggest Egyptian museum in the World after the Cairo's museum. There is also some very famous Christianity sightseeing in Turin: The Shroud of Christ. Many people come from around the World to see this. 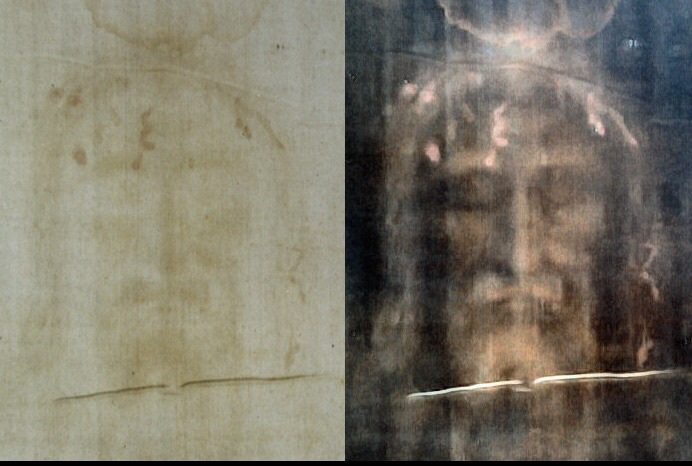 The Turin Shroud is a length of linen cloth with the image of a man, that is believed by some to be the burial shroud of Jesus of Nazareth. The shroud is kept in the royal chapel in Turin. The Catholic Church has neither formally endorsed nor rejected the shroud. 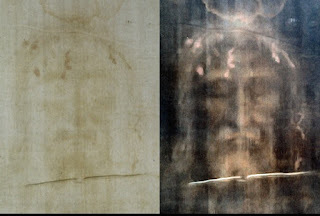 The Shroud of Turin: modern photo of the face, positive left, digitally processed image right. In 2006 Turin welcomed the Olympic Games. Before the year 2006, Turin was known mostly as an industrial city, rather than a holiday destination, but the 2006 Winter Games helped change that image. Turin became the fourth-most visited Italian city, after Rome, Florence, and Venice. Sardinia is great but it is a very expensive place. 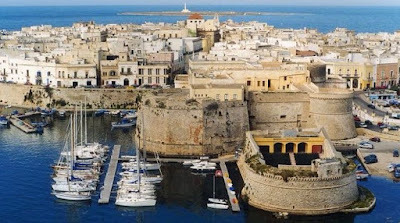 Gallipoli is a southern Italian town and comune in the province of Lecce, in Apulia. This is a great place and not expensive at all. We had this conversation in online school engoo.com with the teacher Gennie. Great job! I hardly had to make any corrections. 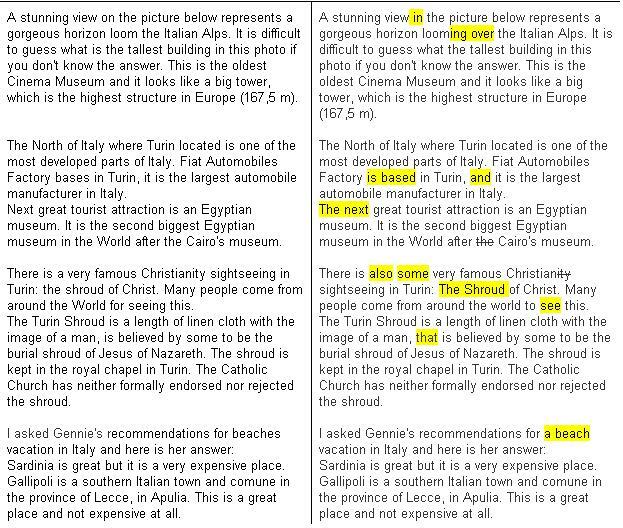 Some phrases didn't sound natural and there were minor grammatical errors, which I highlighted, but overall very good! :) I never had an issue understanding what you were writing.